The renewed movement for expanded learning time offers us an opportunity to do things differently in a way that will really help kids. That is the message that's driven home in a recent interview that the FrameWorks Institute conducted with Karen Pittman, CEO and co-founder of the Forum for Youth Investment. The conversation is part of FrameWorks' efforts to find and shape the answers to an important question: "How do people think about education?" That research pays special attention to issues such as learning, assessment, outcome disparities, the structures of the education system, interventions to improve that system, and the collective benefits of education. Read portions of that interview, in which Karen stresses that we need to think about learning in its more intrinsic form, not as something that happens primarily in structures such as schools. With various people and organizations playing unique roles in your community - focusing on particular issues, populations and geographic areas - someone needs to keep an eye on the big picture, connect the work of those groups and make sure there are no gaps. That's why every successful Ready by 21 state and community has an overarching leadership council. In this webinar, you'll hear how the Forum has worked with states and communities to establish effective leadership councils. We'll explore best practices to help you in forming and sustaining your leadership council, including a hands-on self-assessment tool. An Expanded Role for Youth in Federal Policy? It's not often that you hear, "The latest indicators from Washington are looking up," but that's how it appears for those working to create a strong and consistent youth voice in federal policymaking. Forum Vice President Thaddeus Ferber has been among the leaders of that effort for years, and his new blog looks at progress in the campaign to give young people a meaningful voice in government. Anyone looking to boost the job skills and employment opportunities for young people can learn a lot from a new book about Year Up, the program that offers training, mentoring internships and employment connections to low-income young people. A Year Up: How a Pioneering Program Teaches Young Adults, by Year Up founder and CEO Gerald Chertavian, is getting lots of media play. Chertavian describes the issue of unemployment among youth ages 16-24 not as an achievement gap, but rather as an opportunity gap. Listen to his recent NPR interview here. Further reading: Karen Pittman's blog on how we can help all youth be "ready, willing and able." A new infographic by Community Coalition helps to show how inadequate supports in school and foster care can steer young people into the criminal justice system. 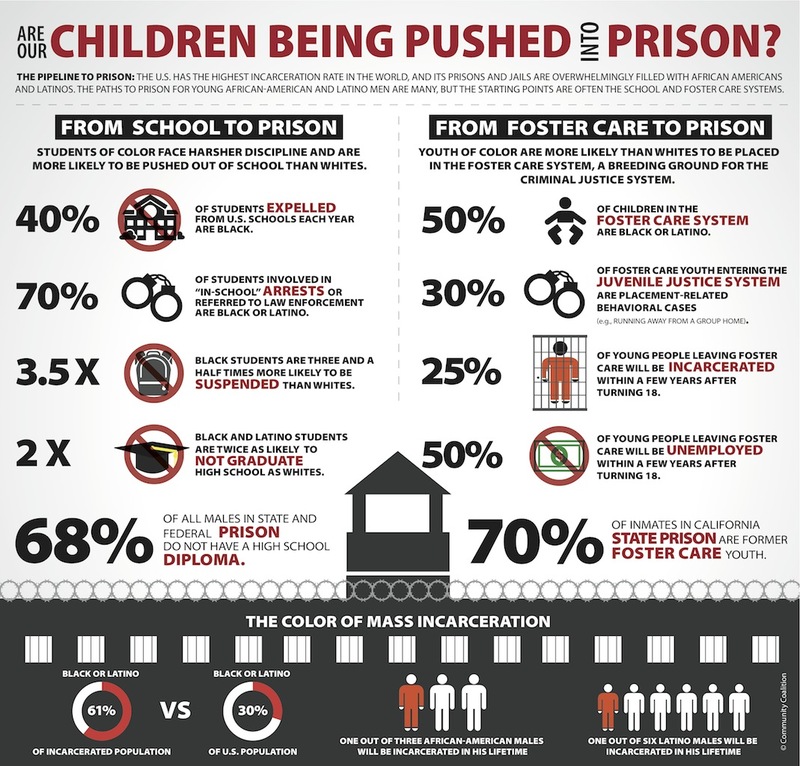 The coalition contends that the education and foster care systems create a pipeline to prison for many youth by failing to effectively connect them to supports such as continuing education, job training and the labor market. See a short summary and a link to the image here. The 2012 Race to the Top-District competition is underway - and communities carrying out Ready by 21 strategies are in strong position, because it gives competitive priority to education improvement efforts that focus on "results, resource alignment and integrated services." The U.S. Department of Education has finalized and posted the application for the competition, which will provide nearly $400 million to support school districts in implementing local reforms to personalize learning, close achievement gaps and use 21st century tools that prepare each student for college and careers. Ready by 21 sites which operate across district lines take note: Consortia of districts can apply together. See the recommendations the Forum submitted to help inform the Department of Education's approach. Over the following weeks the Forum will provide tools and information to help you think about how you can fit into the Race to the Top initiative. Deadline: Aug. 30 for intent to apply, Oct. 30 for applications. Looking to implement a management information system for afterschool or summer but don't know where to begin or what questions to ask? This session introduces National League of Cities' (NLC) new in-depth report comparing major data systems vendors and offers guidance from The Wallace Foundation's recently released data tip sheets. Representatives from leading cities will be on hand to answer questions and advise on how to replicate successful strategies from around the country. The 10th Annual Bridge Conference brings together afterschool and youth development professionals, school leaders, funders, researchers, policymakers, trainers/coaches and business leaders from across the country. The conference focuses on research, cutting-edge resources and strategies for strengthening services. This year's theme is Empower Youth Voices. The David P. Weikart Center for Youth Program Quality will play a prominent role: Staff will facilitate sessions about improving program quality, and Executive Director Charles Smith will deliver a keynote address.